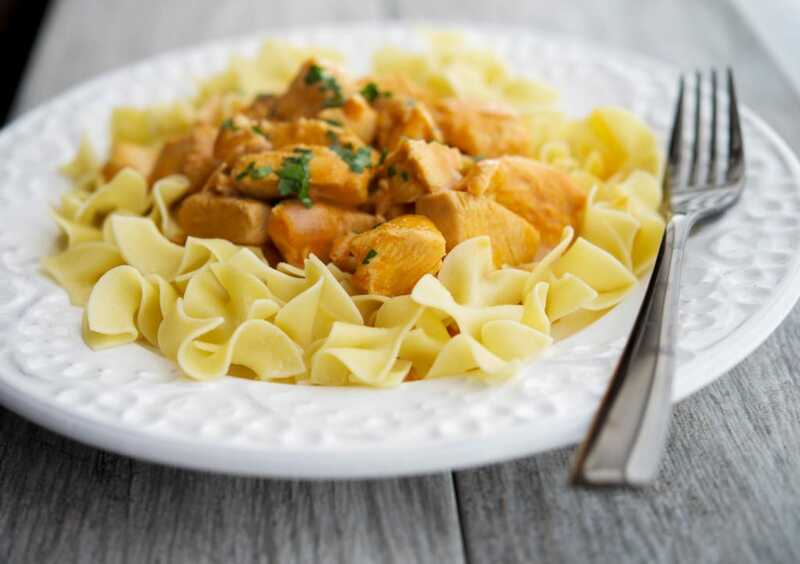 Boneless chicken breasts simmered slowly in a cream sauce made with Hungarian paprika and Greek yogurt over No Yolks Dumplings. Do you crave comfort food during the cold weather? I certainly do and making quick and easy meals like my lightened up version of Chicken Paprikash over Dumplings using No Yolks Dumplings Noodles makes it even better! No Yolks are the only noodles I use whenever I make stews or chili at home. 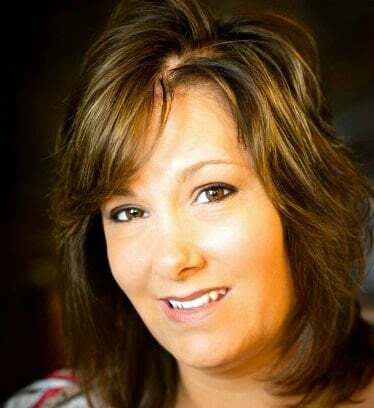 They really hold the flavors of the recipe I’m serving; not to mention they are always smooth, firm and delicious. No Yolks noodles are cholesterol free, low fat and low in sodium; which is very important to me since I suffer from high cholesterol. 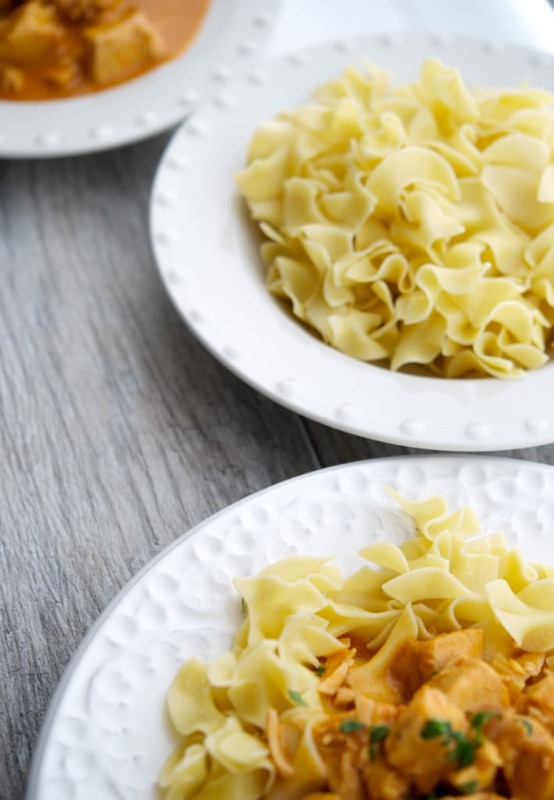 Products like No Yolks take the guess work out of figuring out how much cholesterol is in the food I’m eating and the noodles always cooks up right. 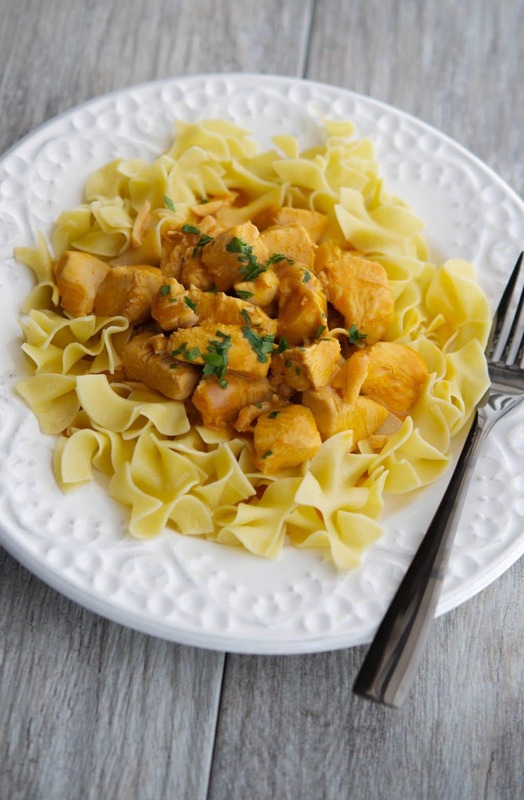 The recipe I wanted to share with all of you today is a lightened up version of Chicken Paprikash. For this post, I received two samples of No Yolks products: Dumpling Noodles and Extra Broad Noodles. The funny thing is, I already had a package in my pantry! 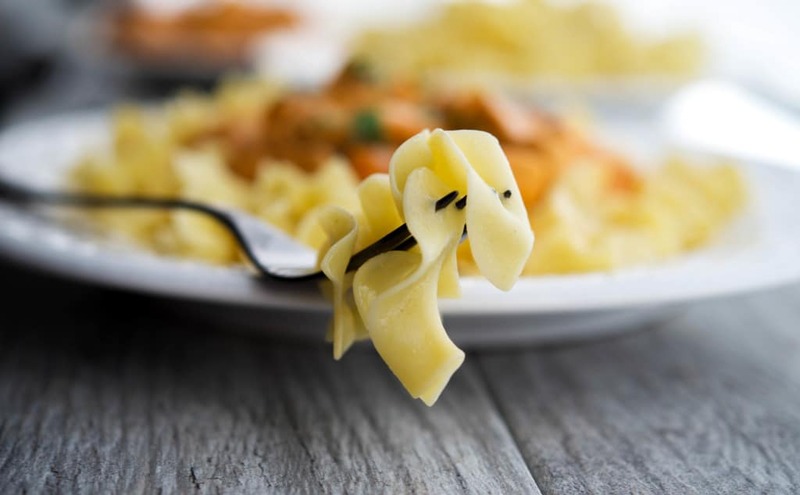 I chose to use the dumplings for this recipe; as they are the widest noodle at almost 1″ in width and are perfect for rich, full meals like this one. Just look at how they hold their shape and don’t break apart like other brands I’ve tried. 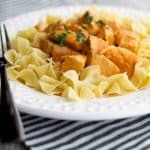 Most recipes I’ve seen for Chicken Paprikash utilize whole chicken pieces like legs or thighs, but I wanted to lighten my version up a bit. 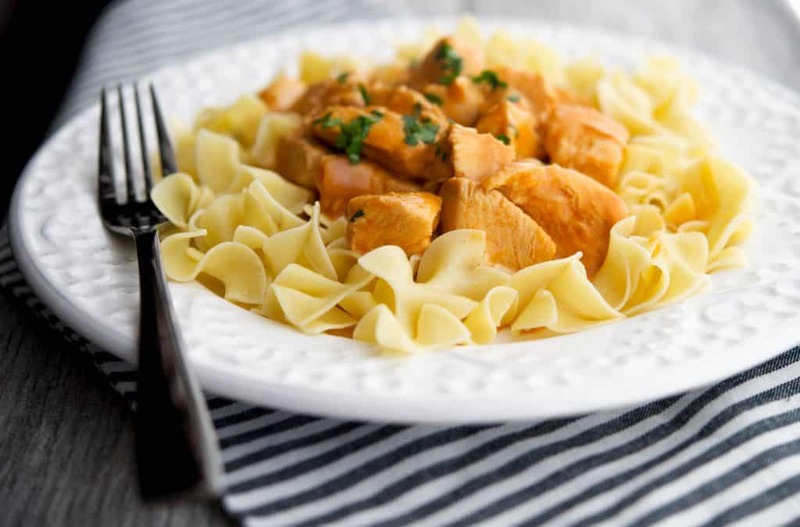 For this recipe I used boneless chicken breasts, diced red onion, fresh chopped garlic, sweet Hungarian paprika and finished it off with nonfat Greek yogurt instead of the traditional sour cream. The entire meal took 30 minutes from start to finish and trust me when I say this was delicious! Cook No Yolks Dumplings according to package directions; drain. In a large pot or Dutch oven, heat oil over medium-high heat; then add the chicken. Brown the chicken until cooked through approximately 8-10 minutes. Next, add the onion, garlic and paprika. Saute 1 minute; then stir in the flour forming a roux. Add the chicken broth, mix well; then cover the pot. Reduce heat to low and simmer for 10-15 minutes until the sauce starts to thicken; then remove from heat and stir in the yogurt. Place the dumplings on a plate; then top with chicken mixture. Serve hot. can i have this like everyday! ?